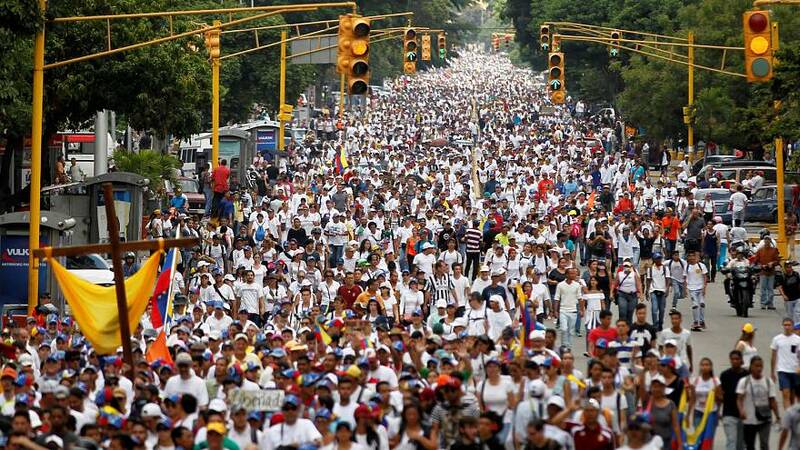 A silent march has been held in Caracas in Venezuela to honour those killed amid anti-government demonstrations. Twelve people have been killed in clashes between protesters and security forces in recent weeks. A further eight people were electrocuted in a looting incident after a protest. Lilian Tintori, wife of the jailed opposition leader Leopoldo Lopez, was on the march. She told reporters: “President Maduro, this is a peaceful march. We have no weapons. We do not believe in violence. “We’re resisting because we want peace, tranquility, we want to be with our families again. “We don’t want Venezuelans to have to loot out of hunger. We want Venezuelans to have food and medicine”. Protesters are calling on the government to hold delayed elections and do more to help people amid tough economic times. Opposition leaders accuse the security forces of being heavy handed against protesters. The ruling party accuses the organisers of deliberately causing public disorder to try to overthrow the government.